The offices at the University of Houston Special Collections are a little quieter than usual today as some of our faculty are on the road, attending the Society of Southwest Archivists annual conference being held in New Orleans, Louisiana. 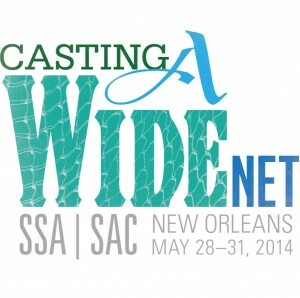 The SSA, a professional organization serving hundreds of archivists, librarians, preservationists and the like, has met annually in one of the six member states since the early 1970s to build relationships among the various organizations and institutions committed to documenting our history, establish standards and principles to help guide processes, and provide education and training to its members. As the conference has grown to encompass more days, more sessions, and more pre-conference workshops, the meat of the meeting remains today and tomorrow. With an overarching theme of “Casting a Wide Net: Broadening the Archival Experience,” panelists will present sessions covering topics like creative strategies to connect archives to underserved populations, ways to better facilitate the undergraduate experience in special collections, as well as boot camps for archivists to help with some of the other day-to-day challenges they face. For those not so well-versed in the archival alphabet soup of acronyms, MPLP or “More Product, Less Process” is shorthand for an approach to the cataloging and processing challenges resulting from an increase in the acquisition of collections and sheer volume of collections in our information age, coupled with stagnant or reduced staffing levels in many archives. MPLP’s modest proposal is an attempt at “pragmatically revamping traditional processing approaches to deal with late 20th-century collections,” and, in the process, provide increased access to researchers while decreasing the number of collections in the queues of various archives. In her paper, Ms. Lavender reports on the specifics of her hands-on experience in the MPLP schema, processing collections like the Main Street Theater Records, the DJ Steve Fournier Papers, and the Carlos “DJ Styles” Garza Papers at the University of Houston. To all the archivists in New Orleans this weekend, a tip of our hats, a hearty “thank you” for preserving our narrative, and here’s wishing you all safe passage as you head home. After a long battle with illness, Maya Angelou has died in her Winston-Salem, North Carolina home. 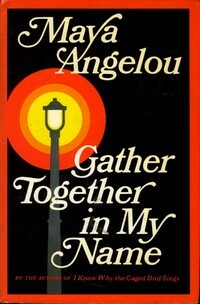 The “lyrical witness of the Jim Crow South,” defied definitions throughout her life and reached the apex of her popularity and cultural presence when she delivered the inaugural poem of Bill Clinton’s presidency, “On the Pulse of the Morning.” Her most lasting and iconic literary legacy, however, is almost certainly captured in, “I Know Why the Caged Bird Sings.” A pioneering work of “autobiographical fiction,” trumpeting the voice of the previously unheralded female, southern, African-American, it was a critical and commercial literary success upon its publication in 1969. Born Marguerite Ann Johnson, April 4, 1928, she would change her name to Maya Angelou in the 1950s while performing calypso at The Purple Onion nightclub in San Francisco. Dance and song were mere branches of a creative and artistic life that was evidence of a broad talent, emerging not only as poetry and prose in her lifetime, but also in opera, film, and civil rights activism (just to name a few). Recounting the winding narrative of her life, she would publish a series of autobiographical works, beginning with “Caged Bird,” that documented the twists and turns that blazed as a crucible of neglect and sexual abuse, leading her to the depths of crime and poverty. No surprise in retrospect, but in 1969 it no doubt raised eyebrows that this work resonated with so many and testified with such authority. As we remember Maya Angelou, we invite you to the Special Collections Reading Room to study this work or any of Angelou’s other works in our holdings. We wish her a lasting peace, assured that what she placed on paper and singed into our psyche will make certain her lasting legacy. 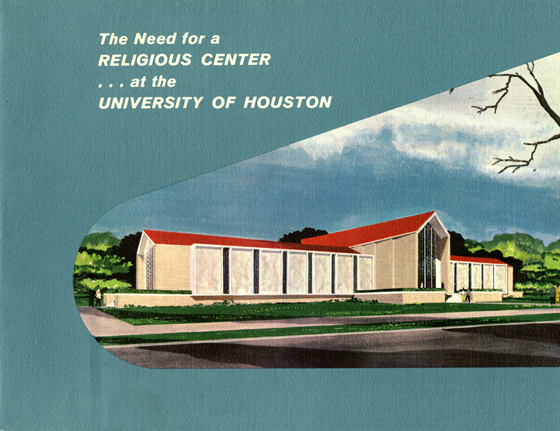 On a Sunday afternoon, forty-nine years ago today, the A.D. Bruce Religion Center (then the “University Religion Center”) was officially dedicated on the University of Houston campus. Built out of University President A.D. Bruce’s desire to provide facilities for the growing and diverse religious communities on campus, the A.D. Bruce Religion Center offers a focal point for religion’s role in higher education, hosting programs and activities while placing an emphasis on dialogue between the faiths. The A.D. Bruce Religion Center is the permanent home to numerous campus ministries. Focal points include a stunning University Chapel (which serves as a popular site for weddings and other occasions befitting the grandeur afforded by the abundant use of glass in the design, creating a vision of towering walls open to the University campus), along with a smaller Meditation Chapel, and facilities and services find themselves in demand year-round from students, faculty, staff, alumni, and the community at large. 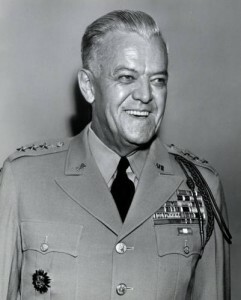 A.D. Bruce, LTG (Ret.) arrived on campus in 1954, after a lengthy and successful career in military administration that included serving as First Governor of Hokkaido, Japan as his 77th Infantry Division occupied the island. He was named to succeed retiring University President, C.F. McElhinney. 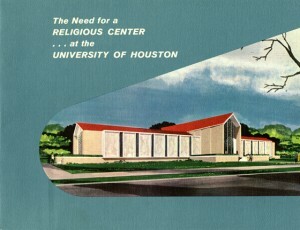 The story of a religion center on campus has a common thread shared with much of the University’s history–the unprecedented growth of the student body in the post-war years of the 1940s and 1950s, represented most visibly in the rapid and necessary establishment of housing that became known as the Veteran’s Village. With barrack-like quarters housing a population of veterans and their families on campus in the years following World War II, while that same population began establishing a growing and disparate number of student religious groups (unified in 1947 as the “Religious Groups Council”), a retired general like Bruce was struck by one glaring omission as he strolled across campus. 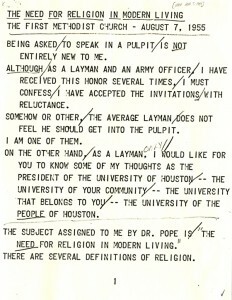 How is it, he asked, that soldiers on an army base have access to a base chapel, but students living at the University of Houston do not? The rest, as they say, is history. 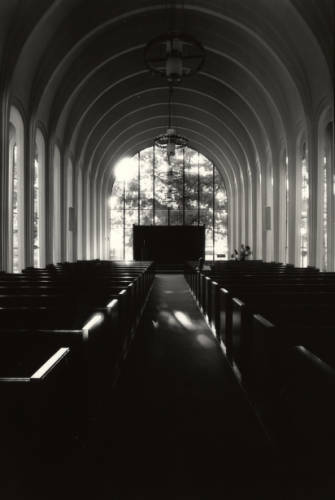 There were plenty of speed bumps and even a few roadblocks along the way (issues of church-state separation became particularly thorny as the University sought to become a public institution), but a consensus was built among the Religious Groups Council, the Board of Regents tapped architect Frank Dill to begin work on the proposed building, funds were raised from various sources (including substantial contributions from the religious groups themselves), ground was broken, and construction culminated with the dedication of the University Religion Center on May 23, 1965. In attendance that Sunday afternoon were clergy, dignitaries, members of the community, and one former University President and Chancellor of note. Retired from the University of Houston in 1961, A.D. Bruce would travel from his home in North Carolina to see a dream of his, born almost a decade prior, finally come to fruition. General Bruce would pass away in 1969 and is buried in the Arlington National Cemetery. 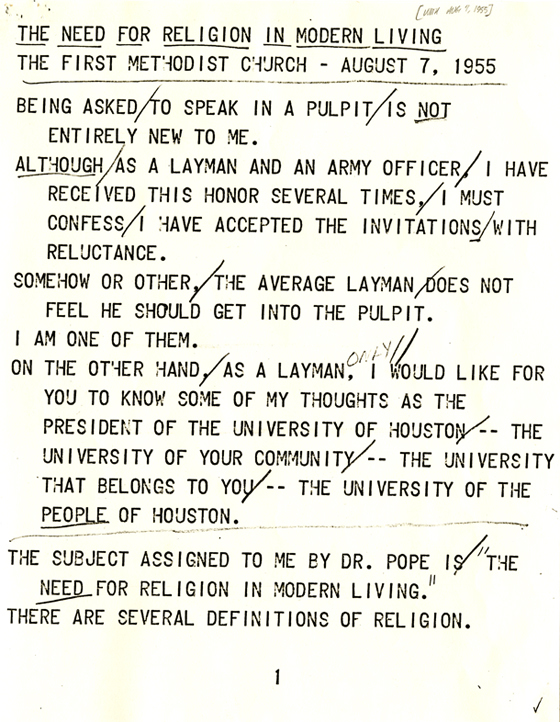 That year the Board of Regents voted to change the name of the University Religion Center, in honor of A.D. Bruce and his vision of the role religion could play in higher education. Those interested in further details should be sure to read Vardell’s history of the A.D. Bruce Religion Center. Ready to dig deeper? Come see what new light the University Archives might shed on the subject! A new exhibition opened over the weekend in the Texas State Capitol. Citizens at Last: The Woman Suffrage Movement in Texas, documents the struggle for women’s suffrage and the unique history of the movement in the state of Texas during the nearly three decades of struggle that immediately preceded the ratification of the Nineteenth Amendment in 1920. The exhibit, presented by Humanities Texas, runs through Saturday, May 24th and documents not only the development of the movement to extend equality across the genders, but also those who battled against this progress. 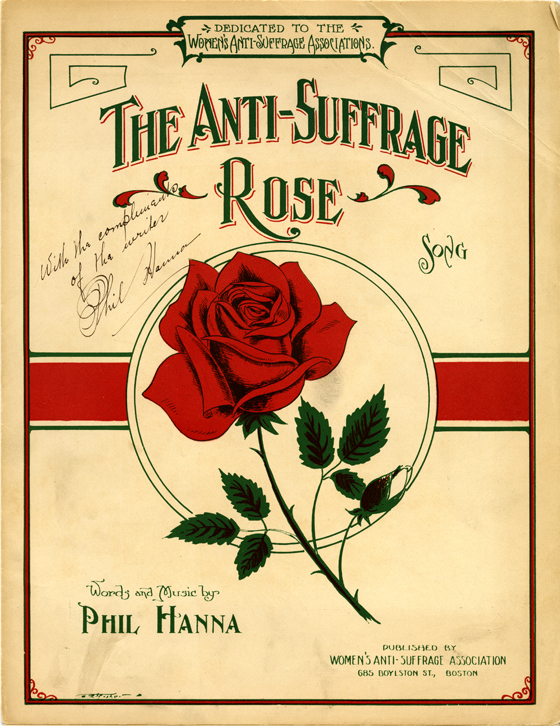 The anti-suffragist movement came to manifest itself in a number of ways. Some were deceptively raw (these examples of anti-suffragist postcards and visual art are likely to have you alternating between sporadic wincing and baffled laughter) while others, in retrospect, seem downright bizarrely sublime. 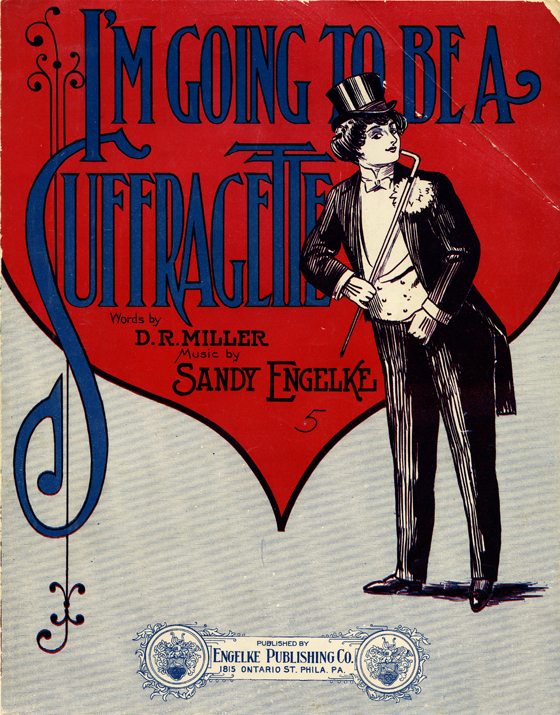 Suffragist sheet music has been fairly well-documented. However, a closer study with a wider sampling of the sheet music produced during that time may may serve to expand our understanding of the role of art and, specifically, music in the midst of political strife. 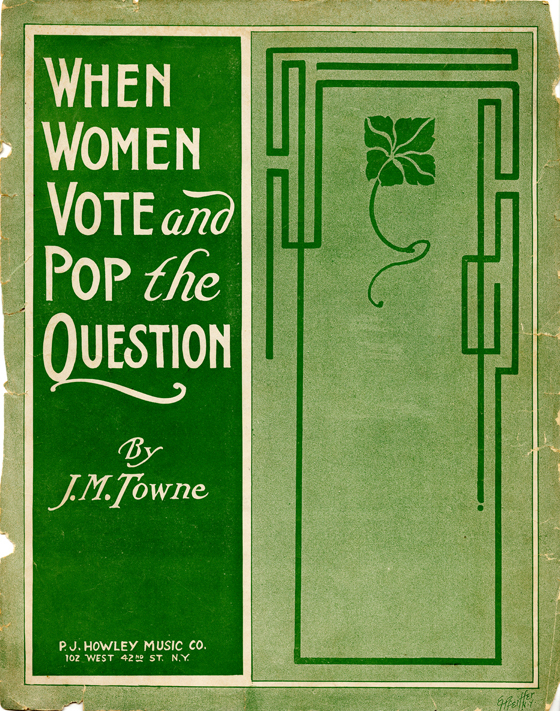 Those fighting for the right to vote for women penned iconic anthems like “Give Us the Ballot” and “Under Fire: March and Two Step” (often sold as a fundraising tool for “Political Equality Clubs”). Anti-suffragist groups sought to co-opt the popularity of this new genre by introducing some parlor music of their own. I present to you, the musical genre of anti-suffragist sheet music! While the University of Houston’s Music Library is definitely the destination to visit on campus if you are serious about your research of musical scores, it is not uncommon for Special Collections to be approached by researchers desiring access to our surprisingly rich reservoir of historically significant sheet music, including the anti-suffragist songs described above. You will not want to miss J.M. 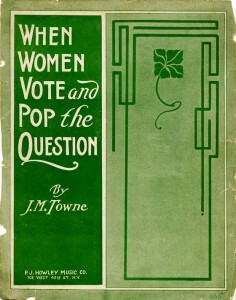 Towne’s “When Women Vote and Pop the Question” which has us all wondering in song if we are ready for a bleak and horrible future where, “Men will play second fiddle, / Stay at home and grease the griddle, / While the women buy the shirts.” If you are interested in glancing an alternative political atmosphere where the public debates are not framed by the much-maligned “political correctness” of our current day, we invite you to visit us and take a closer look at these confounding relics from our not-so-distant past. Suddenly thinking before speaking, or writing songs, may not seem like such a burden to carry. The Houstonian Yearbook collection in the UH Digital Library is currently unavailable, and we apologize for any inconvenience. We are working on making this collection available again as soon as possible. In the meantime, if you would like to take a look at the yearbooks, feel free to visit the Special Collections Reading Room during our regular hours, or contact University Archivist Mary Manning with questions about the books.